Catriona was elected to the NFWI Board of Trustees in June 2013 and is Chair of the WIE Board. She also sits on the Denman, Finance, Food & Garden and Membership Development Committees. Catriona was born in Aberdeen in Scotland and originally lived on Rousay in the Orkney Isles. She moved to Lincoln with her family when she was due to start school. Catriona trained as a shorthand typist and worked for East Midlands Electricity before changing direction to become a Credit Controller within that company. Returning to work after having her family she worked as Secretary for a firm of Accountants, in Lincoln. Catriona joined Hykeham Forum WI in 1979 and became President for the third time in March 2017. She has previously been both Treasurer and Secretary. 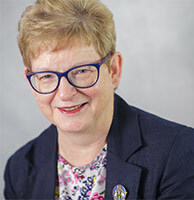 Past Chairman of Lincolnshire North federation, Catriona has also chaired the Members’ Advisory committee, in addition to other roles as Assistant Treasurer and Catering Co-ordinator. She has helped to organise catering for local events such as the Carrington Steam Rally and a wedding reception at the magnificent Lincoln Cathedral. Catriona spends some of her spare time working as a volunteer for the Citizens Advice Witness Service at Lincoln Crown Court. Her hobbies include Scottish country dancing.